Presenting the NASB Study Bible you've always wished someone would publish. Now it's here! The Zondervan NASB Study Bible is handsdown the most comprehensive, up-to-date study Bible available in the New American Standard Bible translation. And it's the first to use the updated NASB: the 1995 edition of today's most literal English translation, meticulously refined for optimal clarity. Combining this widely respected word-for-word approach with study tools that represent the best in conservative scholarship, the Zondervan NASB Study Bible is like having a complete resource library at your fingertips! At the heart of the Zondervan study Bible is its abundance of in-text study notes. Over 20,000 notes, adapted from the best-selling NIV Study Bible, draw on today's leading experts to provide valuable commentary right where you need it. No need to flip pages to obtain important insights on biblical words, verses, and passages. Here is by far the most complete, detailed set of study notes available today for the New American Standard Bible. And it just gets better from there. An exclusive, center-column reference system guides your study with over 100,000 references. - The most comprehensive, up to date NASB study Bible available, combining the best in biblical scholarship with today's most literal English translation. In-text maps give you an instant feel for biblical geography. An extensive NASB concordance and indexes steer you swiftly to key verses and study resources. And there's much, much more. 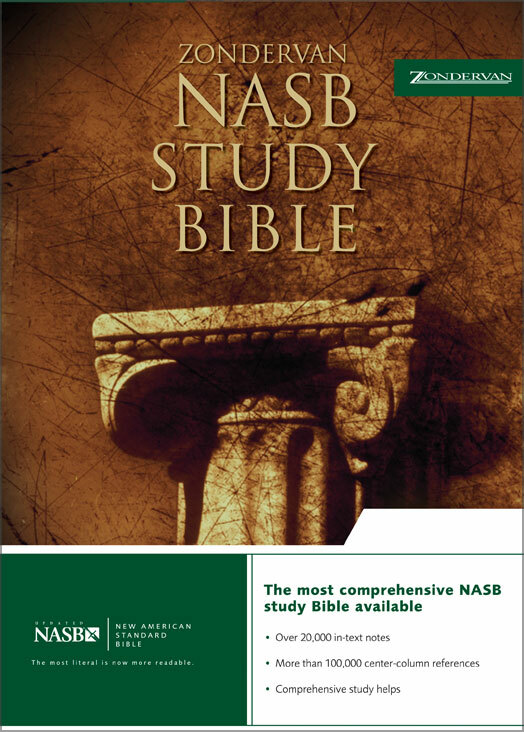 Simply put, if you're an NASB lover, this is the study Bible you've been waiting for. Contemporary. Exhaustive beyond description. Easy to use and remarkably practical. The Zondervan NASB Study Bible. For the dividends of a lifetime, it's the best investment you'll ever make. NASB Study Bible: Black, Bonded Leather by Zondervan was published by Zondervan in December 1999 and is our 13125th best seller. The ISBN for NASB Study Bible: Black, Bonded Leather is 9780310910947. Be the first to review NASB Study Bible: Black, Bonded Leather! Got a question? No problem! Just click here to ask us about NASB Study Bible: Black, Bonded Leather.